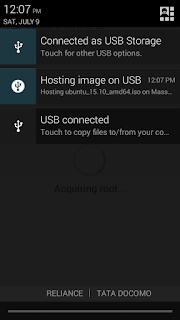 Use your Android as a Live USB packed with Ubuntu/other linux distros/utilities on the go with this cool free app: DriveDroid ~Root required | TechNarcs '+g+"
A live CD, DVD or USB is a bootable media which contains a complete installation of an operating system or utility which can run in the computer's memory/RAM rather without any need to be installed on the HDD. Now this can be extremely useful in many cases such as backing up data in case of OS failure, making changes to the partition table, and also it's a really efficient option for people wanna try out different operating systems without having to dual boot or running em in virtual machines, and there are a bunch of useful system utilities that can be ran on live CDs which we'll perhaps cover in some later posts. If you wanna read more about that, be sure to check out my post on How to create a Bootable Live USB. 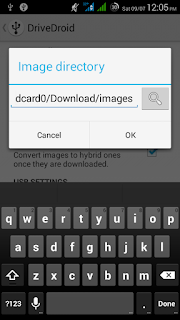 Now android devices usually have the functionality to mount their storage onto PCs for data transfer. 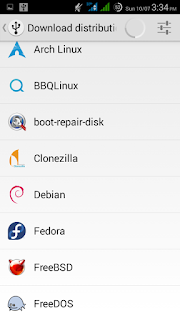 But when used along with root access, certain apps are able to tweak that function to its full potential and allow you to boot your PC from an iso/img stored on your device. 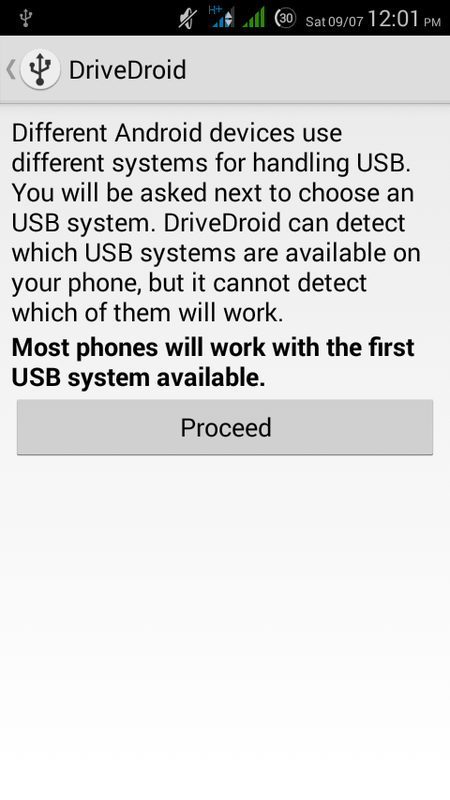 DriveDroid is an amazing app developed by softwarebakery (not owned by me) which does exactly what we talked about above. 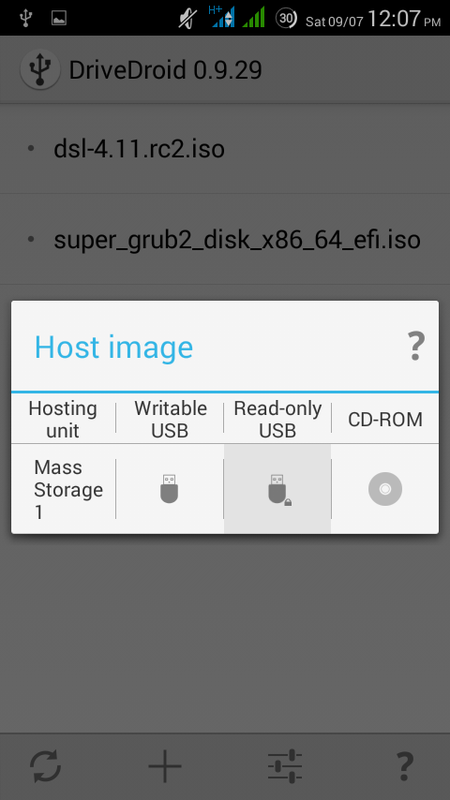 It allows you to boot your PC from ISO/IMG files stored on your phone. 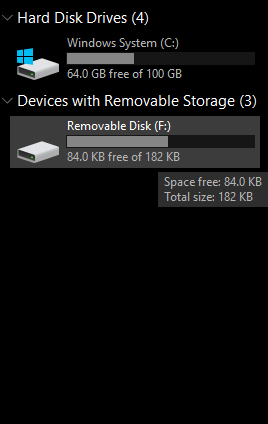 This is ideal for trying Linux distributions (windows too) and having important system utilities on the go, without the need to burn different CDs or USB pendrives. 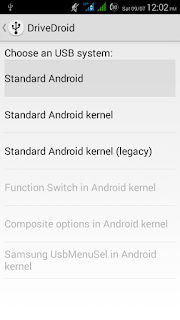 It requires root, and is available on the playstore and on the developer website. It comes in both free and paid versions with minor differences, such as no ads and custom download repos. I encourage you to buy the paid version to support the devs for the awesome app. 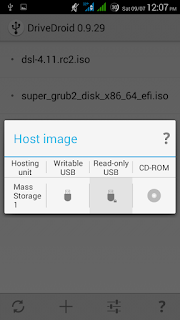 once you set it up, you can use it to host any iso/img on your android device, connect it to your PC and boot from it. So how do we set it up and use it? 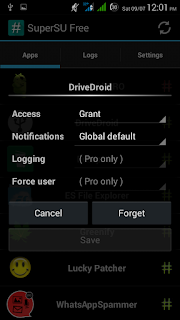 Make sure that you have a rooted phone with supersu(or similar app) to grant drivedroid the necessary root permissions. Once you finish installing it, open the app. There should be a popup asking you to start the setup wizard, click on the "setup" button. 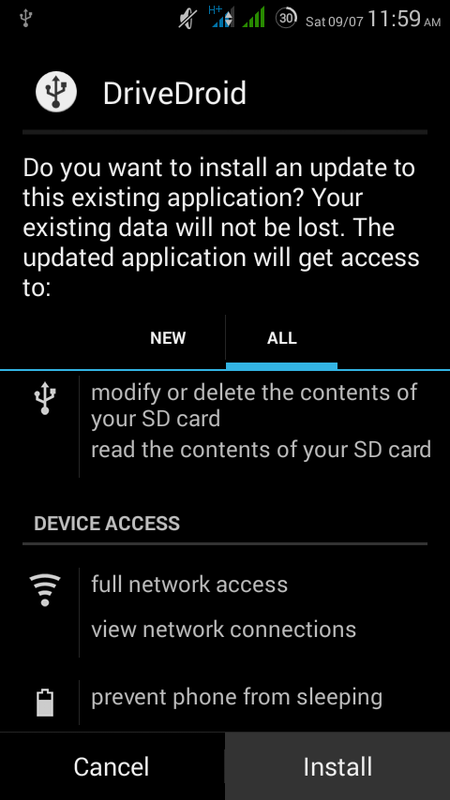 The next page will determine whether your device is in the blacklist/unsupported devices or not, if it isn't then you're good to go, click on proceed to move to the next step. 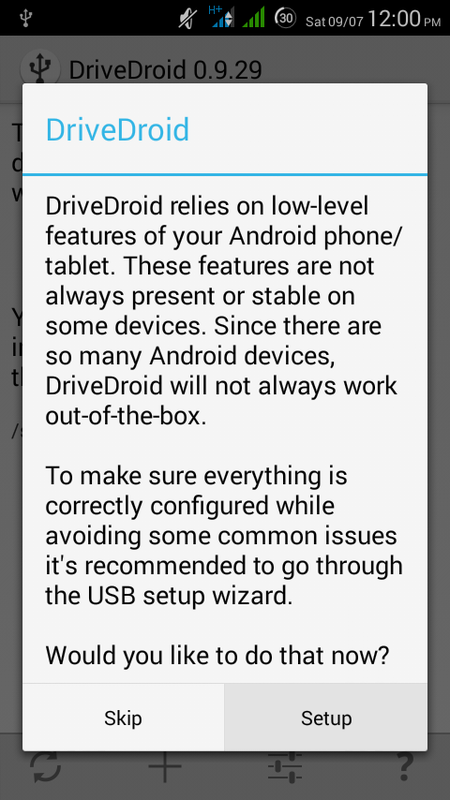 Note: If at any point you accidentally close the setup wizard, you can restart it by going to drivedroid settings>USb setup wizard. The next step will ask prompt you to grant drivedroid root access, click on acquire root and there should be a popup from supersu asking whether to grant drivedroid root access or not, you can also do it manually from the supersu app in case you accidentally fail to grant it root access. 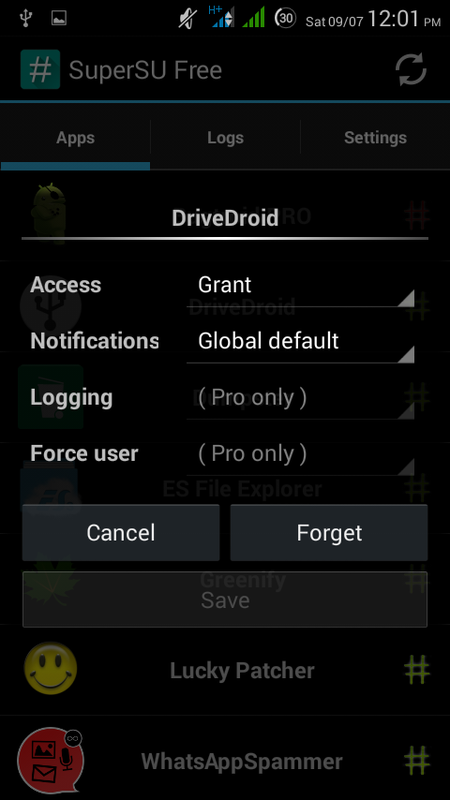 Once DriveDroid has been granted root access, it should proceed to the next step. 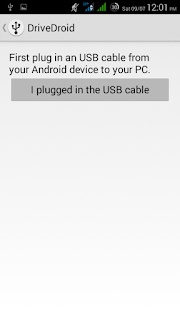 In the next step you will have to connect your android device to your PC using a USB cable and then click on "I plugged in the USB cable". 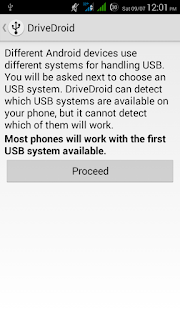 In the next page click on proceed and you thenyou'll need to choose your USB system, drivedroid automatically places the best USB system for your device on top so choose that one. 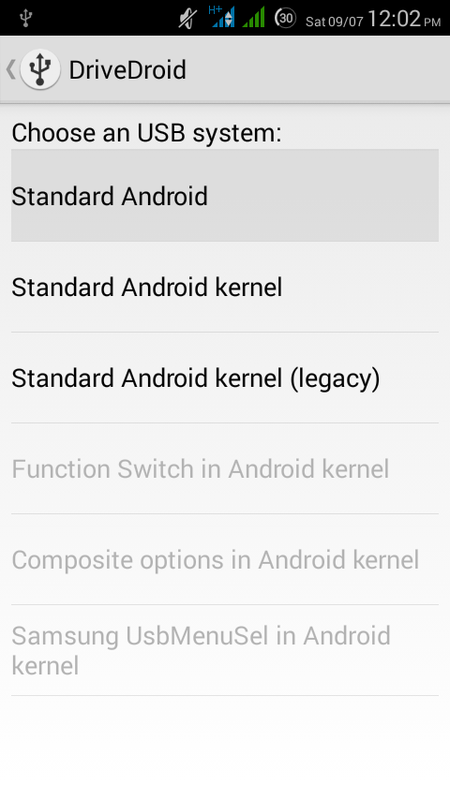 Although if you face any problems later then you might wanna switch to standard android kernel(legacy). After you've chosen a USB system. 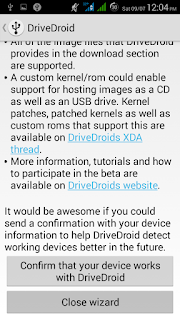 drivedroid will host it's image via USB and if it's successful, you should see a USB drive or a CD drive show up on your PC's file explorer under removable devices. 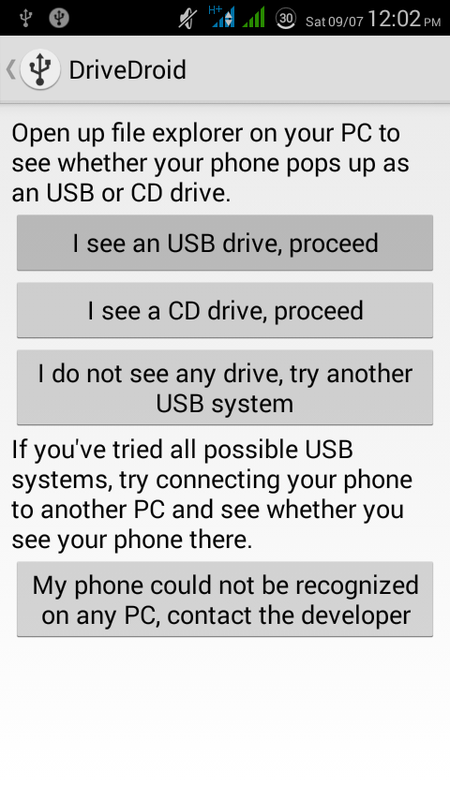 Choose "I see an USB/CD drive, proceed"(depending what showed up on your PC). 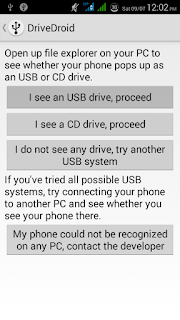 If no devices show up then click on "try another USB system" and choose a different USB system and try again. 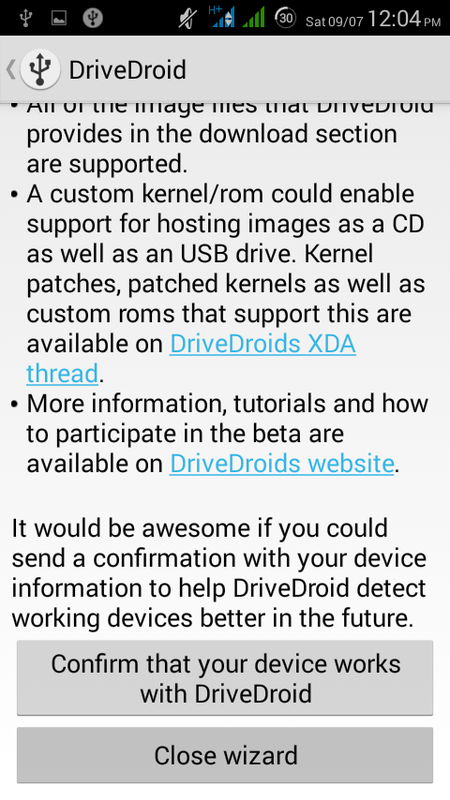 Now DriveDroid will prompt you to reboot your PC and boot from your phone. 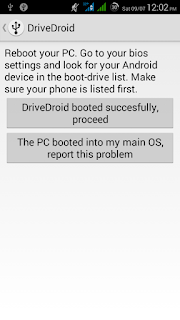 Although it should do that automatically, make sure your phone is selected as the primary boot device in the boot device option in your BIOS or Startup menu. 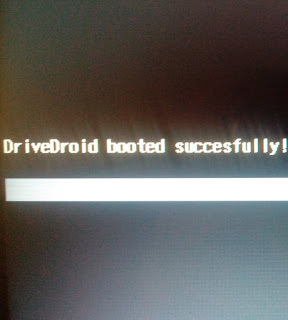 If all goes well, your PC should boot from your phone and display "DriveDroid booted successfully" as seen in the above image. 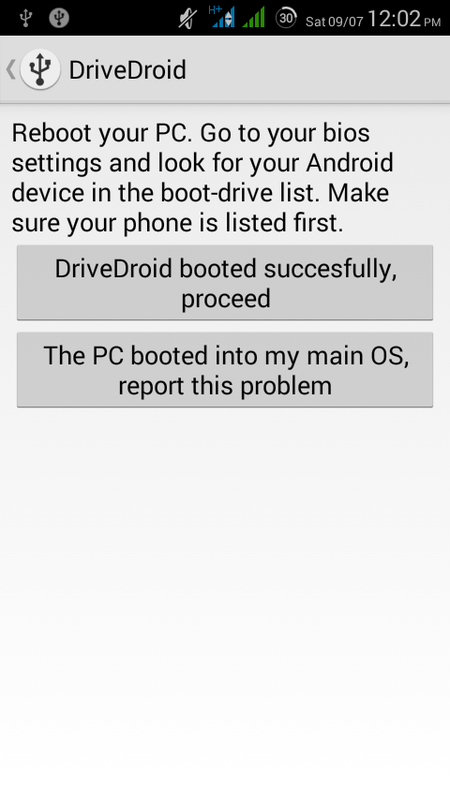 If you are able to successfully boot from drivedroid, you've finished the setup and confirmed that drivedroid works with your phone, you're in the safe zone now. 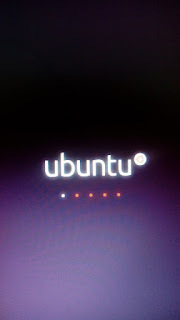 All that's left for you now is to close the setup and boot from any iso/img you want. First go into settings and make sure you know where the image directory is. 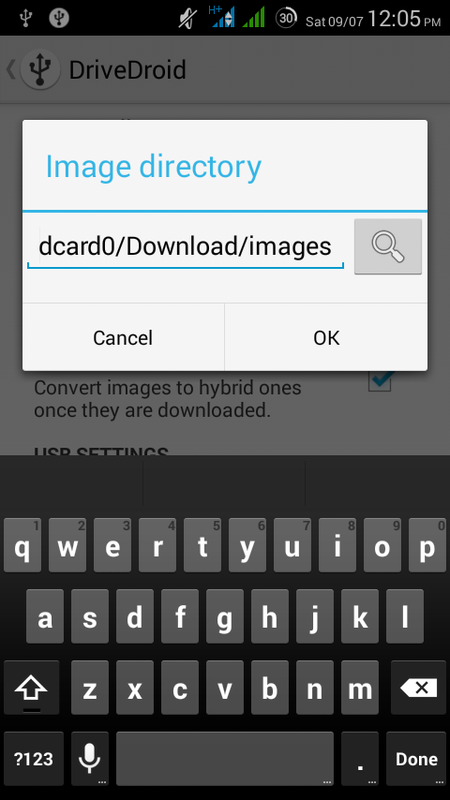 Now you have 2 options, you can either use your own img/iso files that you wanna boot from by placing them in the image directory, or you can download them from the huge repositories by clicking on the "download image" option that pops up when you click on the + icon in drivedroid's bottom taskbar. 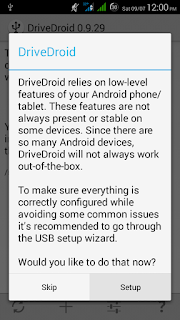 I suggest, for starters, you download "SliTaz" from drivedroids download option and test it out since it's extremely small(35mb). 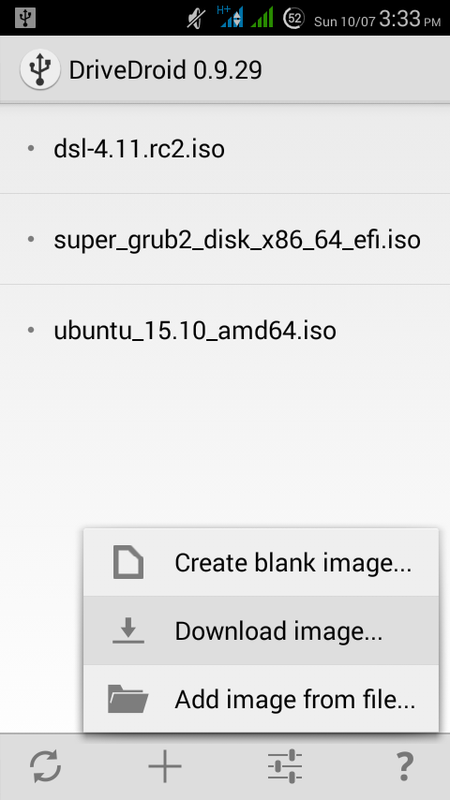 Or if you already have an iso with you (like I got ubuntu's), you can place that in the image directory and click on refresh so it shows up in your drivedroid's image list. 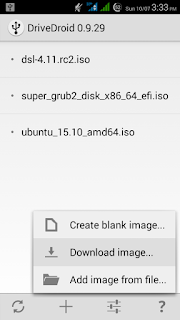 Once you've got an image you wanna boot from, all you need to do is connect your android to your PC via USB, open drivedroid and click on the image you wanna host (I'm using an Ubuntu iso). 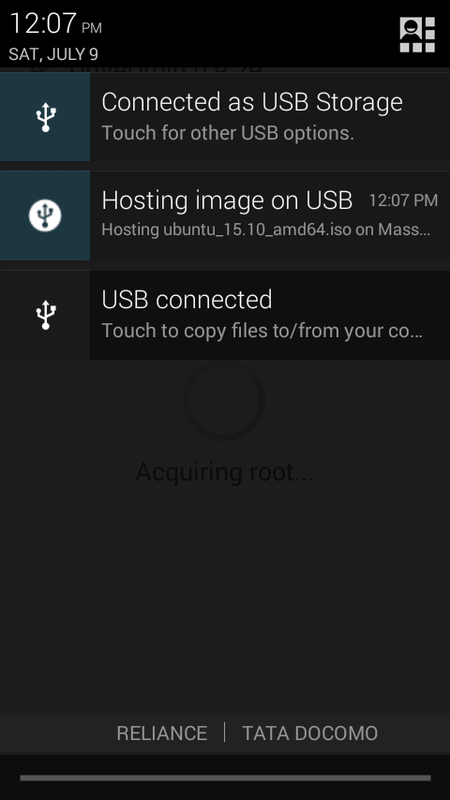 Choose "Read-only USB" in the popup and, if successful, it should show "Hosting image on USB" in the notification. Now reboot your PC and boot from your phone. 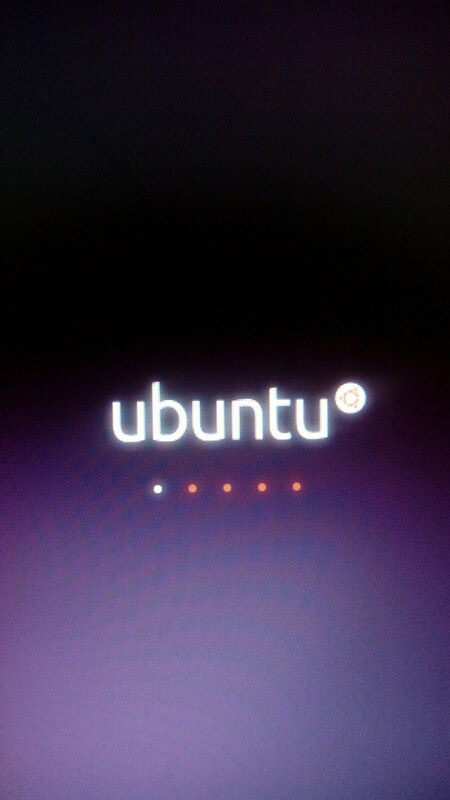 It should boot from up ISO. 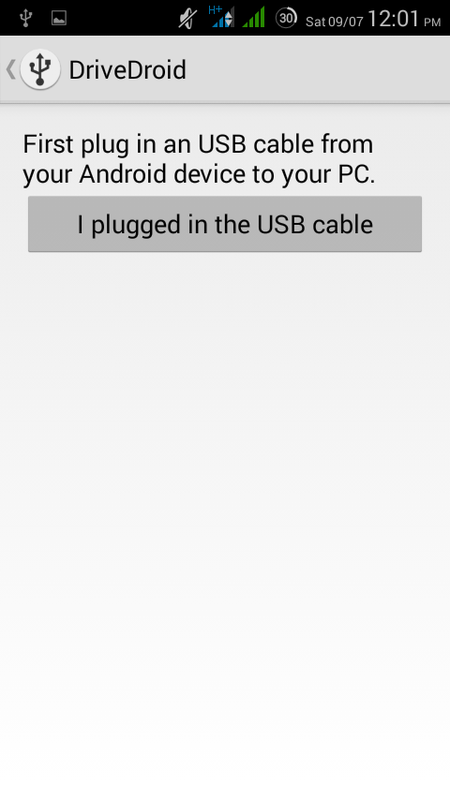 And with that you have successfully booted your PC from an OS hosted on your android, you can also mount a blank image and install a customized OS in it to use later. 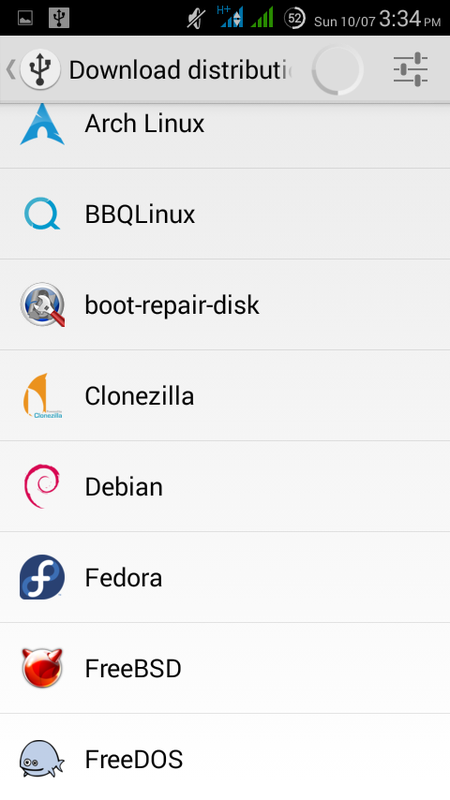 This is an extremely powerful app as now you can have multiple operating systems and/or important system utilities on your phone(as long as you have enough storage) that can be booted from any computer that supports booting from external media.